Every communication service provider (CSP) is today facing a major challenge: traditional, hardware-based monolithic network architecture is no longer up to the tasks demanded of it. Consumers want more than voice and SMS with data services as an add on, and they want it on demand. And business customers – particularly in performance-critical verticals such as healthcare and finance – need their telecommunications set-up to give them an edge in the market and come with the highest level of quality assurance. Telecoms, therefore, need to adjust their way of thinking (which itself can in some cases be rather monolithic and cumbersome), and address this challenge by embracing the cloud. In this, they can learn a lot from the over the top (OTT) players such as Apple, Amazon and Facebook. In short, every CSP that intends to remain competitive on tomorrow’s market must begin transformation today, radically changing their business model by adopting cloud-native architecture to become a digital service provider (DSP). Learning from the OTTs, CSPs will understand that software is the foundation of such digital transformation. The right BSS/OSS supported by software-powered cloud-native networks brings benefits of virtualization, modularity, easy scalability and responsiveness to all of a CSP’s tech operations. And the principles behind such a shift are surprisingly simple. As the OTTs already know, development, integration, deployment and maintenance must be automated. Moving to the cloud facilitates high availability and “continuous everything” – addressing key demands of business and consumer clients. In addition, stateless software will ensure that operations are distributed and processes can be decomposed, while horizontal and vertical modularization facilitates scaling, and containerization means software packaging and delivery are consistent and easily automated. Going cloud-native allows CSPs to transform in a way that facilitates the complete digital experience for B2B and B2C clients alike. Brick and mortar stores and other physical points of sale will still have their place, but among operators whose target market consists mainly of millennials some are already adopting a digital-only approach. This means omnichannel, by which customers can switch between sales and communication channels, on any device at any time, and always simply pick up an order or conversation where they left off during their last visit. 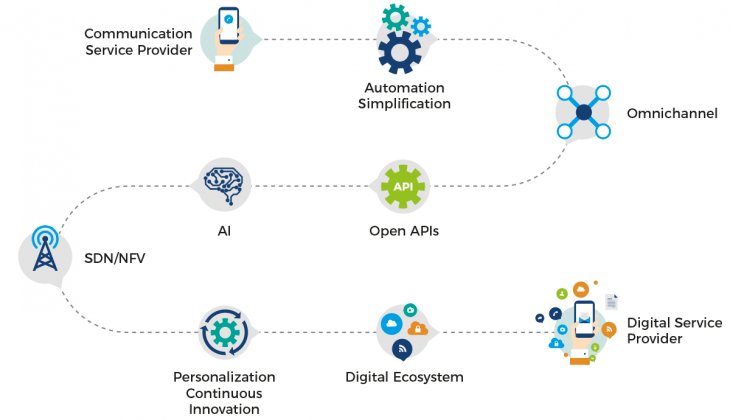 Such a strategy calls for a well-layered IT architecture, in which all business processes, data models and logic are stored centrally and exposed to all possible interaction channels via omnichannel process engine and open APIs. Offer complexity and the management of products and services are facilitated by a centralized product catalog, which additionally speeds up deployment and delivery. In addition, CSPs making the digital transformation should deploy a robust recommendation engine powered by artificial intelligence, which can learn the preferences of individual customers and groups and deliver perfect next best engagement suggestions and personalized offers every time. This means big data analytics built into the cloud BSS/OSS stack implementing open digital architecture (ODA) principles. Business needs and IT development should also feed into each other. Cloud-based solutions promote such a synergetic relationship, allowing telcos to configure everything quickly and easily according to customer requirements, build, test and launch services in fail-fast mode, innovate more and automate practically everything. There’s another business case for the cloud that should be obvious: monolithic hardware by its nature involves a degree of architecture redundancy, with some elements lying idle for perhaps long stretches of time yet still adding to a CSPs costs every day. In the cloud, operations can be scaled automatically to meet demand at any given moment, so operators only ever pay for what they use. In conclusion, the question of if a CSP should take steps toward digital transformation in the cloud looks increasingly moot. The real issue is not if at all – but how.